What do you do when prayer feels futile, an endless rehashing of your problems? If one of the most practical reasons we pray is to obtain strength from God, then we need to understand how that happens. Prayer is about more than making requests. In addition to our agony and questioning, Scripture teaches us to also offer up our surrender. We can voice not only loneliness, resentment, and frustration but also peace, hope, and worship. When we let Scripture teach us a breadth of prayers, we begin to be filled with God's fresh life. 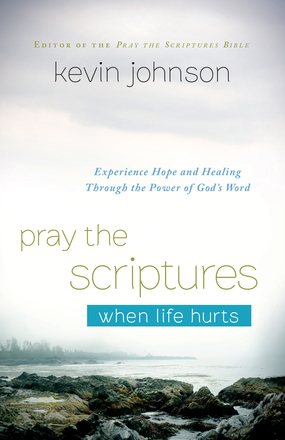 Interweaving his own story of inner anguish and physical illness, Kevin Johnson takes you through nine key Scripture passages that will help you find peace. Each passage is broken down into smaller portions, paired with short phrases to prompt you to pray Scripture back to God. Learn how to talk to God in your pain. This book was very well written and brought me a lot of peace. So much so, that I chose a special friend who I thought might also enjoy it, and sent it on to her. Praying the scriptures can be a powerful way to connect more deeply with God, and a wonderful way to instill the scripture in your heart for the dark days. I hope one day to check out the Bible that goes along with this book. Each chapter of the book focuses on a different emotion. A few examples are loneliness, resentment, frustration, surrender, hope. Each chapter begins with the author sharing some of his thoughts and experiences with the emotion and then there is a section with a Bible verse followed by questions/journal prompts and a space for you to write your answers. I feel this book would also fit well into a group study. It lends itself well to further discussion and study. or here, from Bethany House. **I received a free copy of this book in return for an honest review. All opinions are mine. Praying the scriptures is very powerful. In doing so, we pray what God wants to hear which is His word spoken back to Him. This sounds like a really great book. Love the song......oh......precious.......like YOU, beloved. My sweet Shelly. YAY, so WONDERFUL to read your post first thing this morning! And what a great TRUTH ... too often, my prayers are just requests, and when they are not answered, it is so easy to get discouraged, but prayer IS so much more than just making requests ... talking to God about what He has already written to me! I was so excited to find this post yesterday. I'm on the planning team for a women's conference next weekend and we're taking the ladies through an exercise on praying scriptures. I just ordered this book as a give-away prize - seems the perfect tie-in! May have to order another one for myself, too - I want to read it.